Infiniti’s extensive lineup of 13 models provides a vehicle for pretty much anyone’s taste, and in the middle of the group lies the EX35 compact crossover. Infiniti, the luxury division of Nissan Motor Company, has been selling automobiles in America since 1989, when they introduced the Q45 and M30 sedans to our shores. At present they make four crossover series vehicles, and the EX35 is the smallest among them. The others are the FX, JX, and the QX, the biggest of them all. The QX is the model I so enjoyed early in June. The 2012 EX35 AWD was painted “Garnet” red metallic with wheat-colored interior leather trim. The model was the “Journey”, Infiniti’s finest in this lineup. Upgrades included heated power front buckets, electric power tilt/telescope steering column, Bluetooth hands-free phone arrangement, maple interior accents, sliding power moonroof, push button ignition, XM satellite radio integrated into a Bose 11-speaker stereo/CD system, USB and Ipod connections, 7” color info display, hard drive navigation system with lane guidance and an attractive chrome analog clock front and center on the dashboard. All these interior amenities made the Infiniti a treat to travel in, but on top of that there existed a small coat hanger on the back of the driver’s seat for a jacket as well as a 60/40, 3-passenger back seat with power up and down capability. Switches were in place inside the tailgate to operate them in case a bicycle or bag of golf clubs occupied your hands when loading. Oh, and I mustn’t forget, the cup-holder was a dual level affair to accommodate either a “tall” or a “venti” Starbucks, no sweat. Just press a switch and the little divider moves out of the way. I’m going on and on about the interior, but I must admit I enjoyed it. Power for the EX is a V-6 providing 297 horsepower and 253 lb. ft. of torque. The 3.5 liter engine is coupled to a seven-speed automatic with manual shift mode. Zero to 60 acceleration is reportedly 7.1 seconds, and the fuel mileage ratings are 17 city and 24 highway. I observed 22.2 mpg during my time with the Journey. The Intelligent all-wheel drive system would be great in the winter, so I wasn’t able to enjoy its benefits, but did enjoy the silky-smooth transmission. 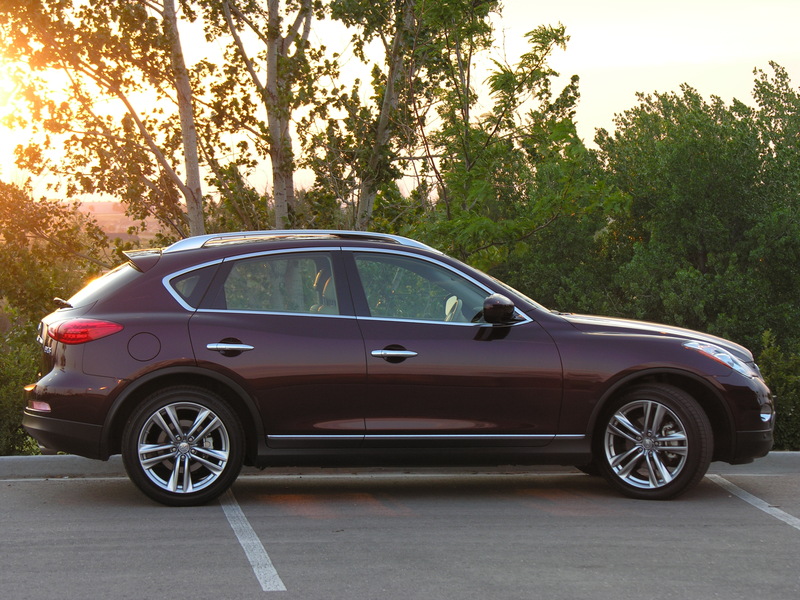 Of all the Infiniti crossovers, the EX35 is not my favorite, styling-wise. But since I am pretty crazy about the looks of the FX and QX, that isn’t much of a knock. On top of the EX was an attractive aluminum roof rail/luggage rack, and the vehicle was fitted with 19”, ten spoke alloy wheels surrounded by 245/45R19 Bridgestone Turanzas. Out back were chrome dual exhaust finishers. Wheelbase is 110”, making the overall length 15”. The M.S.R.P of the Infiniti was $45,095.00, and that included the Journey base price, freight, $2,200.00 for the Touring Package, and $2,700.00 for the Premium Package. Those latter two items provided the nice interior items I described, plus the Xenon headlights, the Around View monitor (like eye in the sky for parking), voice recognition, and the Zagat Survey restaurant guide. The Infiniti Journey EX35 is not inexpensive, but it provides a plush, pretty, personal AWD vehicle and an excellent driving experience for its proud owner.